Keep on the healthy lifestyle. My Chips Alternative – Popcorn! Those who have been reading my blog know that I am a big, big CHIPS lover. When I gave up chips after the New Year, I knew I would have to invent something to satisfy my chip craving. I bought my sister this antique popcorn machine a few Christmas ago and decided to bring it back out. I bought a bag of popcorn kernels from Trader Joe’s. They are organic and only $1.99 per bag! Pretty big too…should give you about 20 servings at least. I seasoned the popcorn with melted vegan butter (Earth Balance), sea salt, paprika, and a big load of nutritional yeast. I coated the popcorn and OMG, they are to die for. Salty and buttery! Way HEALTHIER than chips and tastes better too! Definitely satisfies the salty crunch cravings. You guys need to try this out. It’s fantastic! 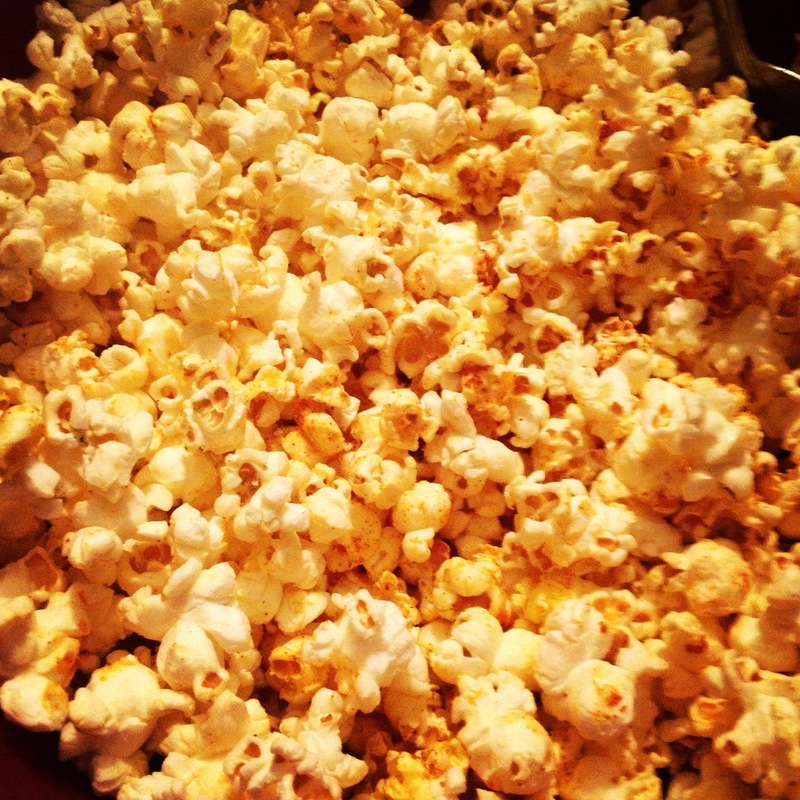 – Top plain popcorn with melted vegan butter, salt, paprika, and nutritional yeast depending on your liking! Posted in DIET, HEALTH, HEALTHY LIFESTYLE, Vegan and tagged healthy, nutritional yeast, paprika, popcorn, sea salt, snack, vegan. Bookmark the permalink. I love lemon bars. There is nothing better than a golden buttery crust with a goooey oooey lemony middle and a little powder sugar dusted on top. 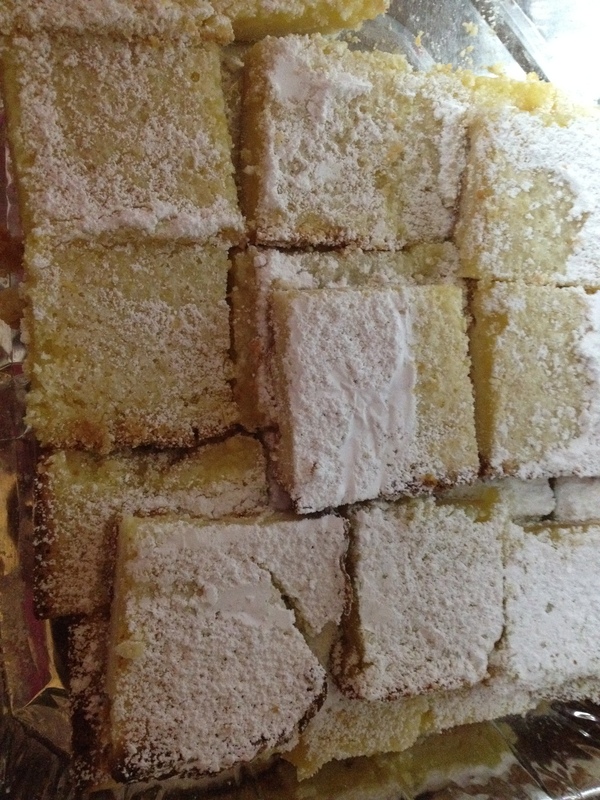 My aunt has passed down her famous lemon bar recipe and I wanted to share it with you guys. These are theeeee BEST lemon bars I have ever had! Be careful because they are SO ADDICTING and not very healthy..but a very awesome and easy dessert to prepare to please a whole crowd. 2. Combine powdered sugar, salt, and flour in a bowl. Mix the ingredients. 3. Use a grater and grade the butter into the bowl. Use a fork to cut into the butter if needed until it looks like fine meal. 4. Put foil over a 9 in by 11 in pan so the bars come out easily. 5. Press the mixture into the pan. 6. Bake the crust for 20 minutes. 7. While the crust is baking, work on your filling. 8. Combine flour and baking powder in a small bowl. 9. Combine egg and sugar into another small bowl. Beat with a whisk until full incorporated. 10. Add the flour and baking powder into the egg and sugar in small amounts while whisking each time. 11. Whisk in the lemon juice and zest. 12. Pour the filling over the crust and bake for another 20 minutes. 13. Let the bar cool COMPLETELY, at least 3 hours before removing from the pan and cutting into the bars. 14. Dust with powder sugar. So far, so good. I did slip on Monday because I drank some boba milktea without even realizing it. I only drank half and gave the rest to my sister once I realized it. After that, I haven’t slipped! =) So proud of myself…I’m thinking of what resolution I’m going to do for the next month and I’m thinking I’m going to give up sweets. Not being able to eat/drink dairy, I find myself looking for vegan desserts which are not necessarily healthier! How’s everyones’ resolutions going?? Are you guys keeping up with them? Keep me posted! 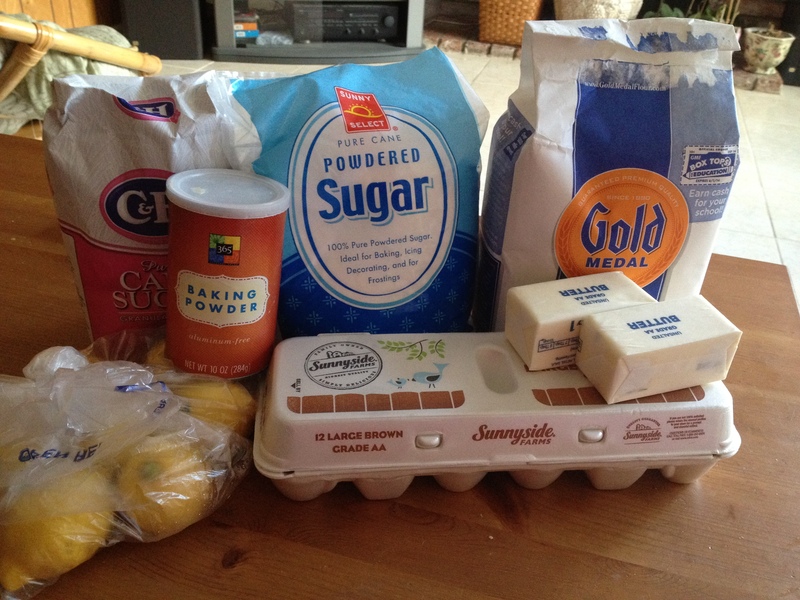 Posted in DIET, Vegetarian and tagged delicious, dessert, lemon bars. Bookmark the permalink. If you’ve ever watched Hell’s Kitchen, you’d think that risotto is one of thee hardest thing to master. Seems as if the chefs on the show have trouble making risotto. However, risotto isn’t hard necessarily. It just takes a LOT of time, presence, and persistence. 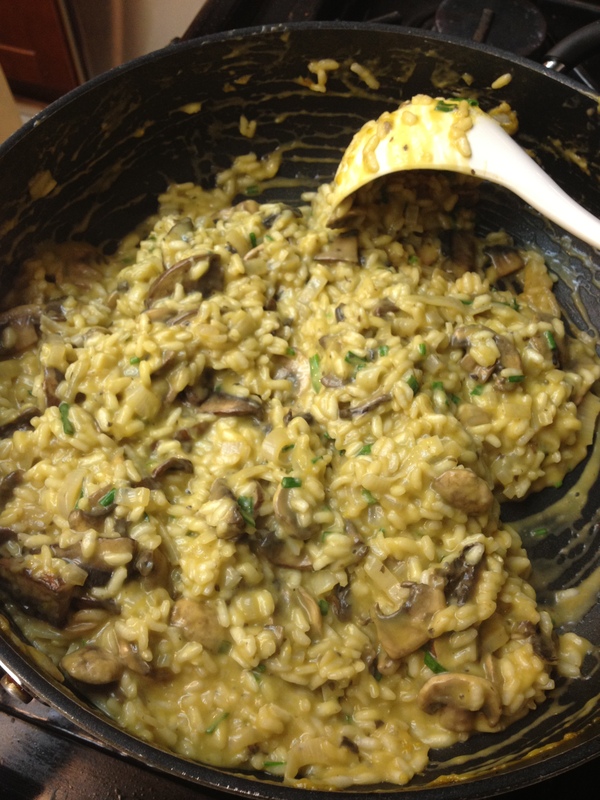 I found a mushroom risotto on all recipes.com that had great reviews so I decided to alter it to my liking. The risotto turned out great. Creamy and flavorful. It would be a great side to serve to your family. 1. 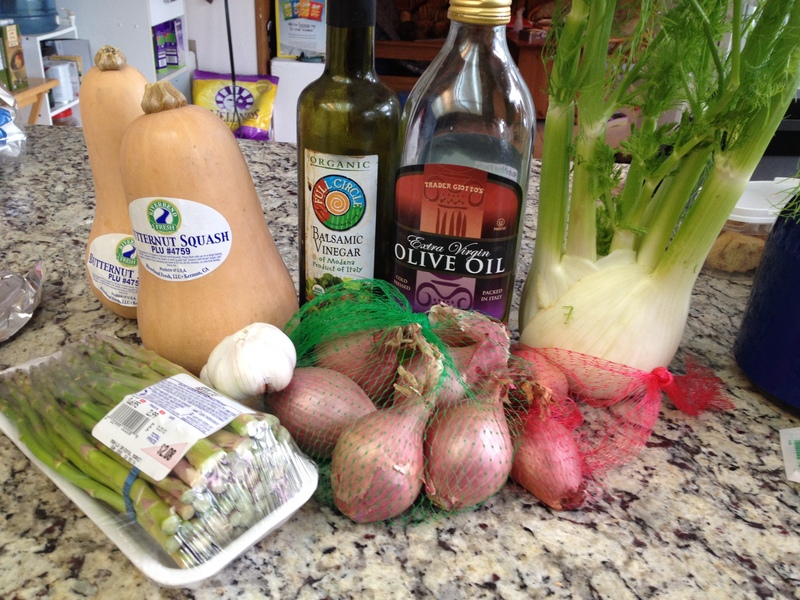 Bring vegetable stock to a simmer. You don’t want it boiling but you want it hot. VERY IMPORTANT TO HAVE HOT STOCK. 2. 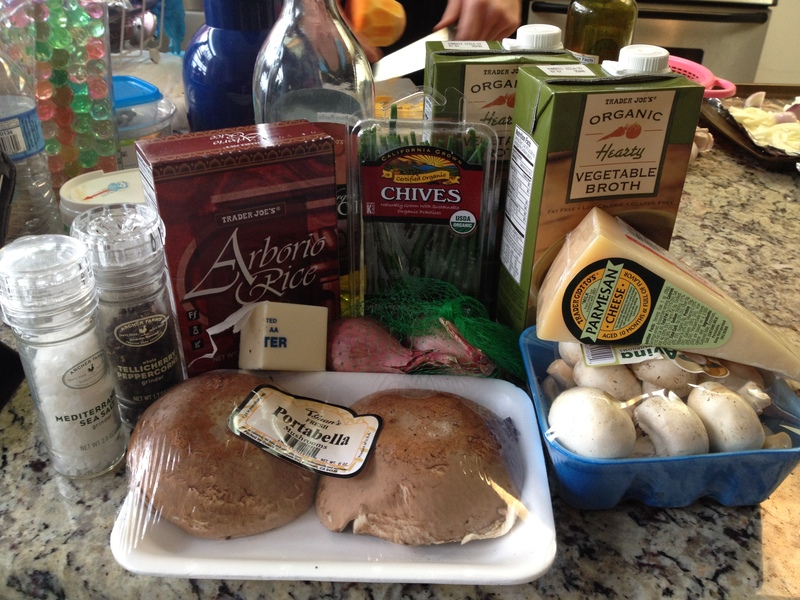 Clean and chop mushrooms. 3. Bring a large pan to medium high heat and put in olive oil. 4. Sautéed mushrooms until cooked and soft. Remove from pan. 6. Add a little bit of olive oil and toss in shallots. After 2 minutes, toss in arborio rice. Toss rice until it’s a golden color. 7. Add one ladle (1/2 cup) of vegetable stock and stir. Continue to add the stock one ladle at a time after the one before has evaporated. You need to stand next to the stove and stir the ENTIRE time. DO NOT LEAVE IT UNATTENDED! 8. Once the rice is cooked and to the consistency of your liking, add in the mushrooms (along with the mushroom water), butter, cheese, chives, pepper, and salt. Risotto usually has the consistency of a porridge. When you put a spoon against the pan and scrape it towards you, the rice should part but then melt back into the center. I like my risotto to be a little thick. Many may think that it’s a goopy mess but that’s how I like it! Haha. So make it to how you like it, if you like it more loose and watery then add more stock, if you don’t then don’t add as much. It’s amazing and perfect on a cold day. Posted in HEALTH, HEALTHY LIFESTYLE, Vegetarian and tagged arborio rice, delicious, food, mushroom, risotto, side dish, vegetarian. Bookmark the permalink. Boyfriend and I was craving salmon a couple of days ago so I woke up early, went to the supermarket, and started on the recipe at 10:00 AM! 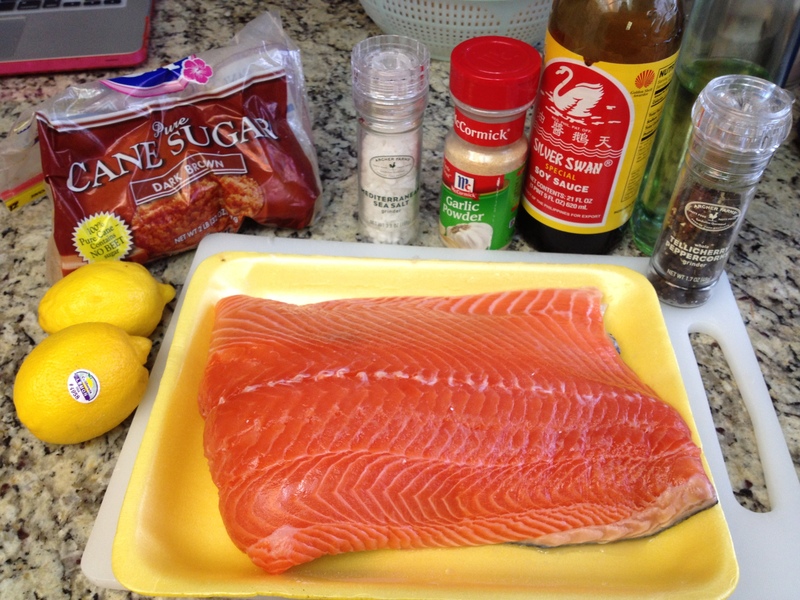 I wanted the salmon to marinate for as long as possible…we actually didn’t cook it until about 6:30PM! The recipe turned out SO delicious. 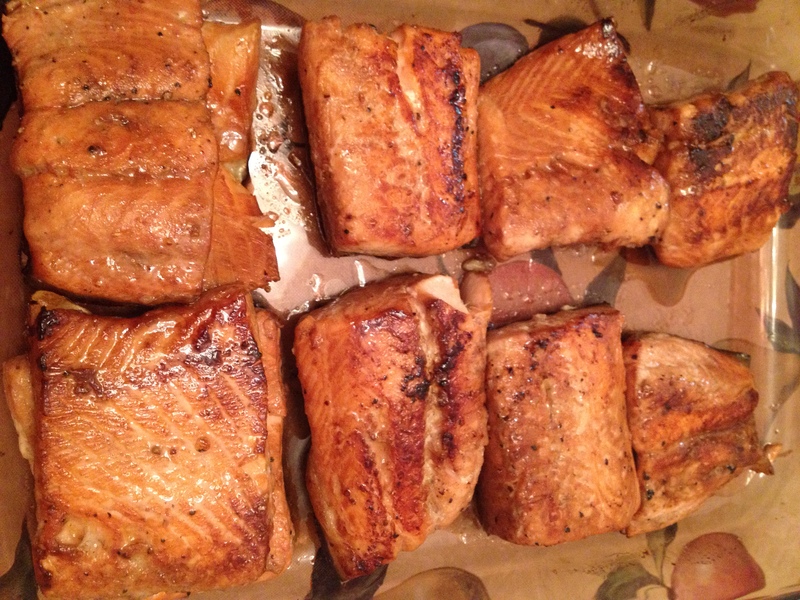 The marinate really seeped through the salmon and gave it great flavor. I wanted to share this recipe with you guys. It really is amazing and easy, easy to make. Salmon is a great source of protein and little fat. So healthy for you and so delicious! – 2 pounds of salmon. 1. Clean the salmon and pat it DRY. 2. Divide and cut salmon fillet into 8 pieces, as equal as possible. 3. Salt both sides of the salmon fillets. 4. 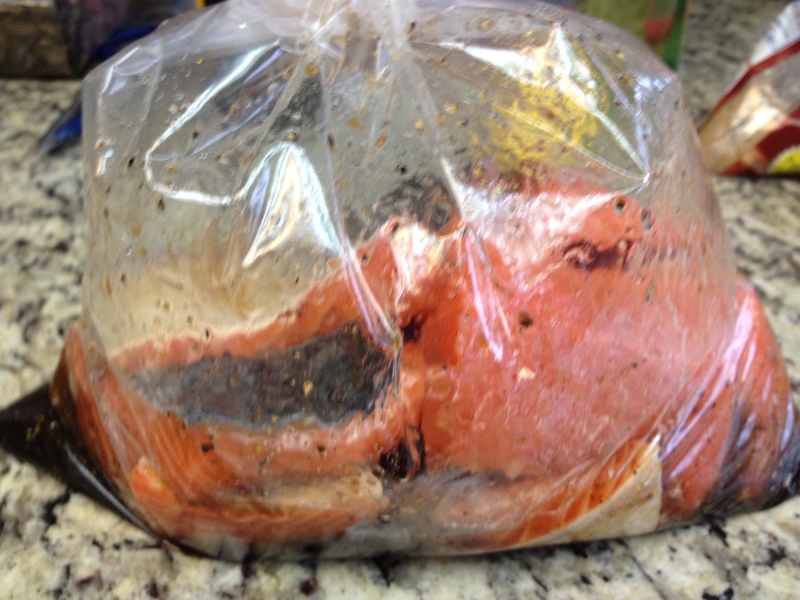 Place salmon into a plastic bag. 5. Stir lemon juice, vegetable oil, water, soy sauce, brown sugar, and pepper into a bowl. 6. Pour the marinade into the bag and throw in 3 cloves of crushed garlic (not chopped). 7. Seal the bag and marinate for at least 1-2 hours. The longer the better. 8. Bring your pan to a medium high heat and put in about 2 tbsp of vegetable oil. 9. When oil is hot, put in the salmon fillet skin side down. 10. Cook for about 5-6 minutes depending on the thickness of the salmon. Skin of salmon should be CRISPY. 11. Flip it and cook on the other side for 4-5 minutes until brown glaze appears. This recipe is also great for grilling or baking. Hope you guys enjoy this recipe! BTW, I forgot to ask, what are you resolutions for the new year?? Posted in DIET, HEALTH, HEALTHY LIFESTYLE, Pescatarian and tagged baked, fish, grill, healthy, lifestyle, marinade, pan seared, pescatarian, salmon. Bookmark the permalink. First of all, I want to wish everyone a happy new year. 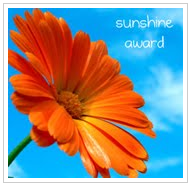 I realize that I’ve been slipping updating my blog and I will do my best to post 2-3 times a week for everyone. Last January, boyfriend and I gave up eating meat. This included: chicken, beef, pork, lamb, etc. We still eat seafood occasionally. I am so proud that we have kept up with it and cannot wait to conquer another year. It is not longer a struggle but part of our lifestyle. This year, as I was thinking of resolutions to set for the New Years, I decided that I’m going to conquer ‘monthly’ resolutions instead. Having a long list of resolution for the new year can be extremely overwhelming. And to be honest, who keeps up with the resolutions for the entire year? Resolutions tend to fail within the first month. I decided that I’m going to have a new goal for every month and commit to it for the 30-31 days, which is still a LONG time! These resolutions can be anything that would be make me become a better person. If I enjoy the outcomes within that month, than I will continue with it. If I don’t enjoy it, I can always stop or adjust it to my liking. “Diets”, food, exercise, hobbies, and service is all an experiment to me. Try it, commit to it, and if you like it, stick with it. If not, change it. No need to beat yourself over something that doesn’t work for you. Acknowledge the uncomfortable and move on. JANUARY 2013: Give up dairy and chips. I’ve always wonder how it would feel to not eat dairy so I’m going to experiment with it. I’ve done some research and there are many benefits to not consume it. I’m going to have to do even more research to ensure that I’m getting enough calcium and nutrients in order to get the essentials that my body needs. Chips has always been my weakness and I KNOW it is not very healthy. I want to challenge myself to find healthier alternative. This is going to hard for me because I’m always craving salty crunchiness. I’m going to do weekly updates so that I can hold myself accountable. Giving up chips has been easy. I’ve been able to find healthier, baked crackers to satisfy my salty craving. Eating them with hummus or homemade guacamole gives me a satisfying snack. Giving up dairy has been HARD, HARD, HARD. I LOVE CHEESE. I make bomb bean and cheese burritos that my family LOVES and they constantly eat it in front of me! I’ve learned to substitute cheese with avocados and also discovered an awesome vegan cheese – daiya. Boyfriend and I actually made vegan pizza yesterday! Will post the recipe for that soon; it was delicious. I also have a fat sweet tooth and can’t have any of the store bought stuff. I usually have a piece of chocolate everyday and giving that up has been hard. So far I’ve made healthy oatmeal raisin and snickerdoodle to help with my cravings. Both with vegan butter of course. Also, went to Whole Foods yesterday! Boyfriend and I got two vegan donuts: blueberry & crumb, and a german chocolate walnut cookie. All 3 were delicious! Thank you whole foods! 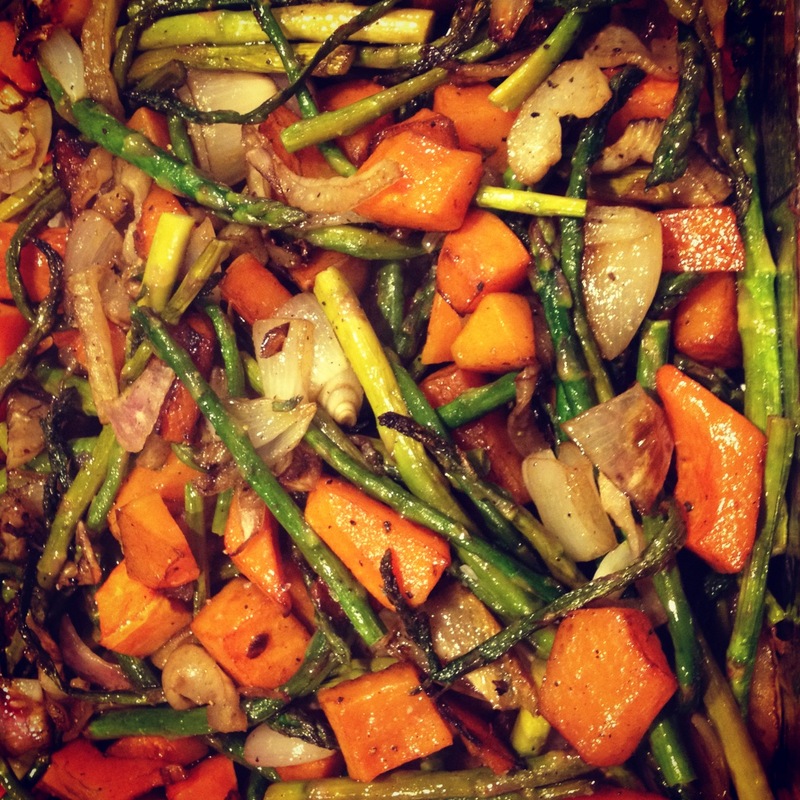 Finally, a new recipe from me: Roasted Vegetables. 2. Chop your butternut squash into bite size pieces. The smaller the pieces, the faster they will cook. 4. Slice the fennel bulb into small slices. 5. Chop and rinse asparagus into 2-inch pieces. 6. 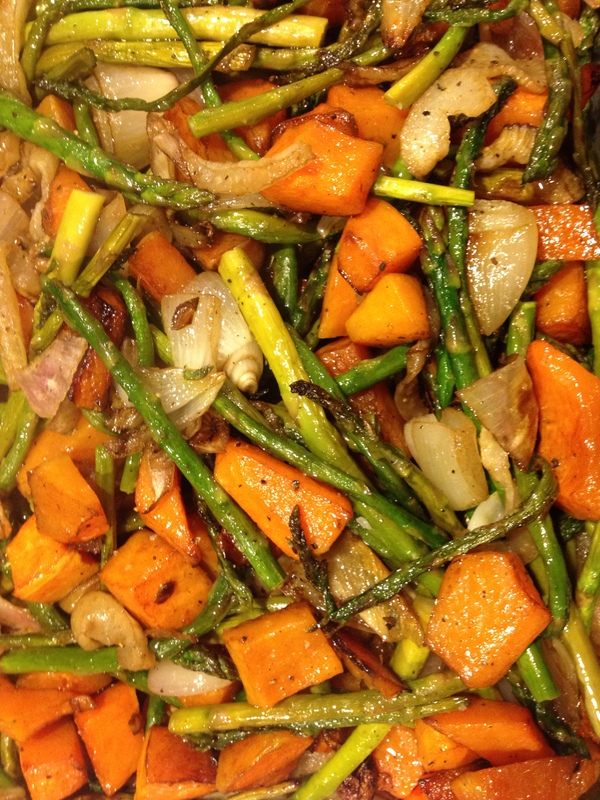 Toss your butternut squash, shallots, fennel, and garlic with the olive oil & balsamic vinegar. 7. Place it in the oven for 20 minutes. Tip: use a large baking pan. don’t crowd the vegetables on top of one of another. You want the sides to touch the pan because that’s where it is hottest. You’ll get a nice golden carmelization on the sides. Do it in two batches if you have to. Please, please try out this recipe and let me know how you like it. It is seriously DELICIOUS! Posted in DIET, HEALTH, HEALTHY LIFESTYLE, Vegan, Vegetarian and tagged diet, new years, resolution, roasted vegetables, vegan. Bookmark the permalink. Food Recipe: 8 Layer Magic Bars! I call these my 8-layer magic bars…I got the recipe from a friend and modified it a little bit. Here’s what you need. 2. Toast your coconut flakes. Be sure to check and stir every TWO minutes. They burn VERY VERY fast. I forgot the first time and out come black coconut flakes..Haha. Once they’re browned and toasted, take them out. 3. Combine the melted butter with crumbs. 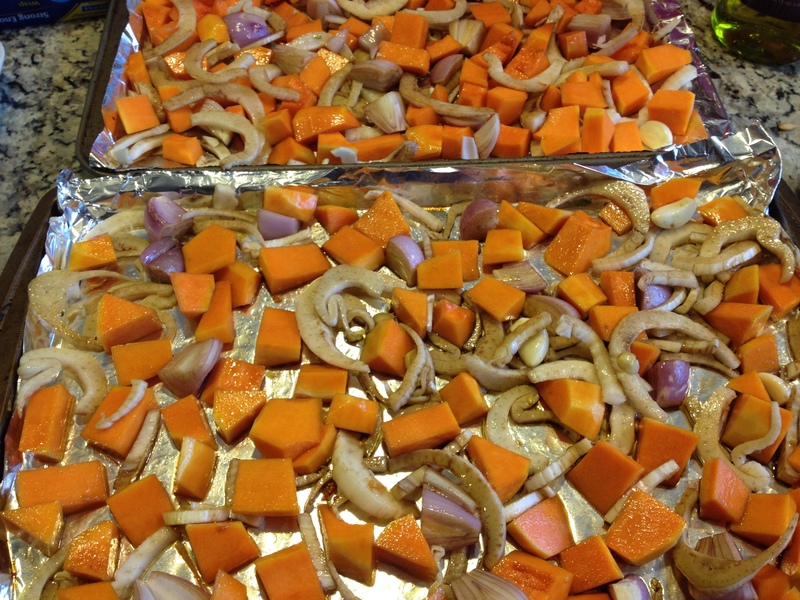 Once all incorporated, press down into a 13 x 9 pan. Foil it to ensure that the bars will not stick! 4. Sprinkle, walnuts, pecans, semi-sweet chocolate chips, white chocolate chips, and butterscotch chips. Make sure you do it in this order. 5. Pour the condensed milk all over. The condense milk makes everything come together. 6. 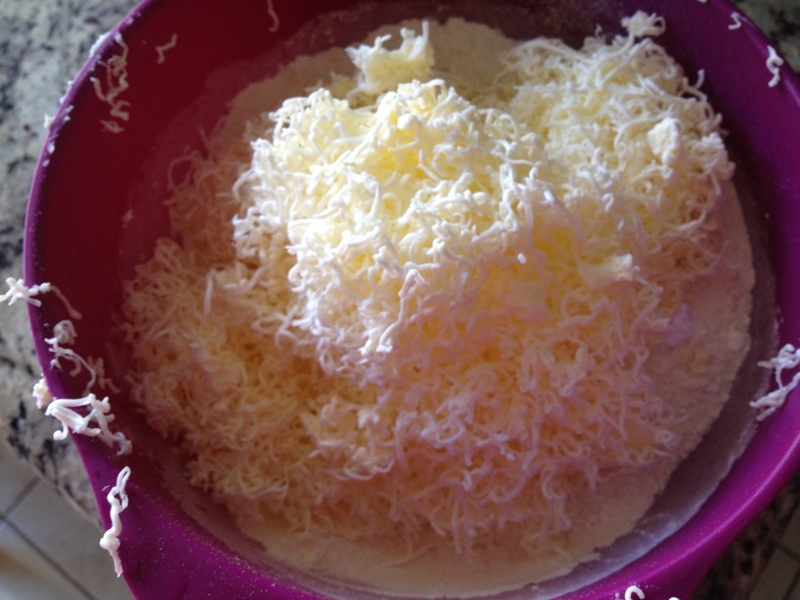 Sprinkle on your coconut flakes on top. 7. Stick it in the oven for 20-25 minutes until the edges are brown. Let it cool COMPLETELY, about 3-4 hours before you take it out to cut or else it will crumble and fall apart. Posted in DIET, Vegetarian and tagged bars, butterscotch, chocolate, condense milk, delicious, dessert, magic bars, sweet, white chocolate. Bookmark the permalink.